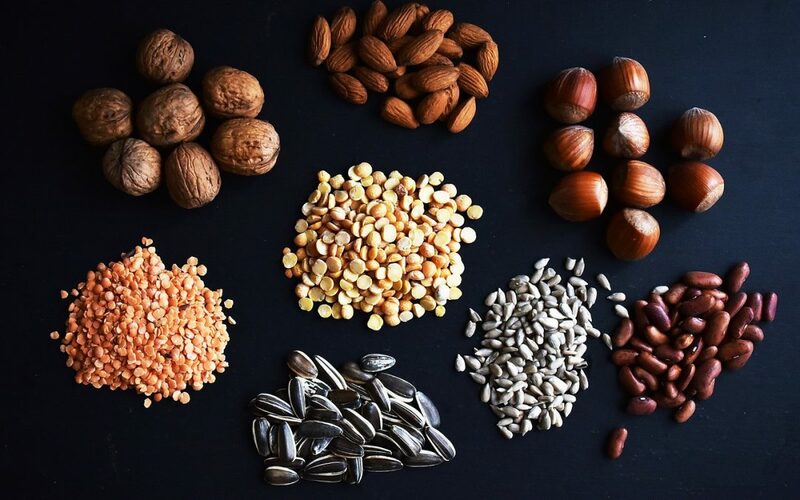 In my last article ‘What Causes Nutrient Deficiencies’, I talked about some of the reasons why nutrient deficiencies can occur, and mentioned one particular list of foods to be aware of – those containing phytic acid. Unfortunately, if not prepared correctly, foods high in phytic acid can contribute to deficiencies – and therefore result in unnecessary health problems. So let’s take a closer look at this group of foods. Nuts, seeds, grains, and legumes (e.g. beans, chickpeas, lentils), are all seeds. Seed foods are very healthy for us, but a common mistake many people make when eating them, is not preparing them appropriately, and eating too many raw. This can actually lead to nutritional deficiencies, as a result of malabsorption. The reason for this is because these foods contain phytic acid – a compound that binds with a mineral in the seed to produce phytates. Phytates inhibit our digestive enzymes, which in turn can make it difficult for our bodies to process and absorb starch, protein, and fat, as well as some minerals – including zinc, iron, manganese, and calcium. Suffering gastric and intestinal symptoms (which can be uncomfortable and even embarrassing – think indigestion, bloating, and…..gas! ), can be a result of phytates too. Obviously we don’t want any of these things to happen! Phytic acid also plays a healthy role for us too though. Research has shown it is important in preventing diseases such as cancer, diabetes, and cardiovascular disease, and other chronic inflammatory conditions. Therefore it is important we consume some phytic acid, but not so much (and not at the wrong time), that it causes malabsorption of other nutrients that our bodies need. This is easily done, once we know how to prepare our foods, and also what a healthy plants-only diet should look like. I cover all this in-depth with many other topics in my nutrition coaching and lifestyle programs, but I thought I would outline a few important tips for you here today. There are several different options with how to prepare phytic acid foods, which will reduce their phytate content, and we will be taking a look at these. Firstly though let’s look at the phytic acid foods most commonly eaten raw, which are nuts and seeds. As a general guideline, a few raw nuts and/or seeds once per day is acceptable (and beneficial), but avoid having them raw any more than this. The best way to consume nuts and seeds is after they have been soaked in water to reduce their phytic acid, then well rinsed, and preferably dehydrated or lightly toasted. This process is called ‘activating’. Soaking times vary for each nut and seed type, and there are a few which do not need to be soaked, so make sure you gain the correct facts on this. So let’s now look at methods of preparing the other phytic acid family of foods. Sprouting is an excellent option for reducing phytic acid. A sprouted food is actually when the plant is at its most nutritious stage too, so sprouting is always a fantastic choice for good health. Already sprouted beans are easily available in grocery stores, but why not try sprouting your own? This is much more nutritious as they will be fresher. You can also have fun sprouting different things; such as chickpeas and various beans. Fermenting is another method of food preparation to reduce phytic acid, and is very healthy as well due to the probiotics fermented foods contain – which are essential for gut health. Milling is also a way phytate producing foods can be prepared; for example, buckwheat grouts being milled into buckwheat flour. Cooking (i.e. heat), is probably the most obvious method to break down phytic acid (e.g. cooking lentils, or rice). Some foods such as nuts and beans, really need to be soaked first as well though, so again, do check the best way to prepare that particular seed food. Another important thing to also consider is how meals are put together. This is because a phytate food can prevent absorption of nutrients not just from its own source, but also from the other foods it is being combined with – this particularly happens with foods high in iron, zinc, and calcium. So if you do use a non-prepared phytate food, think carefully about which other foods you are using at the same time. For example, if you put raw nuts in a meal with a high-iron ingredient such as broccoli, you will probably not absorb the broccoli’s iron (or at least, not all that you could). Occasionally this might be okay, but if done frequently, this is how an iron deficiency could occur (as opposed to what many people incorrectly think of as the cause of low iron – a lack of meat consumption). Looking at this meal combination example of nuts and broccoli though, if the nuts were activated (soaked, rinsed, and dehydrated/toasted), prior to them being added to the broccoli meal, then iron absorption would not be prevented, and absorption of nutrients would actually be promoted. Having a high amount of vitamin C in a meal containing phytic acid foods, can also help counteract the meal’s phytic acid content (think tomatoes and capsicums in your lentil/bean curry or casserole). Probably one of the easiest ways to help neutralise phytic acid, and assist absorption of nutrients in our meals, is by adding a squeeze of fresh lemon juice or splash of raw apple cider vinegar. This is why both of these are fantastic ingredient options for salad dressing. So a good guideline if you are in doubt that a food needs to be prepared prior to eating, is to just check if the food is a seed. Chickpeas, lentils, and rice, for example, are all raw seeds which are easily identified as needing preparing before eating, so it helps to think of nuts, seeds, and other legumes, as part of the same ‘seed family’. Just a little bit of extra advice to keep in mind too when looking for recipes and food guidance (no matter what diet you may be following). Always bear in mind how these seed foods are being recommended to you to be used – has the appropriate preparation of them been advised? This is such an important step in ensuring good health with our nutrition, if correct preparation of these ingredients has not been included in a recipe, I would definitely be looking elsewhere for your meal ideas and food guidance. Unfortunately there are endless misguided ‘healthy’ recipes and eating plans available – many of which from ‘food experts’, who have never studied nutrition, and are unaware of how to prepare and combine foods for good nutritional health. So please always make sure you gain any nutritional information and guidance from an appropriately qualified source (such as myself 😉 ). Thanks for reading. I hope you have found my tips helpful. Please do not hesitate to contact me if you are interested in my personalised coaching service to assist you with any of your nutrition, fitness, health, and lifestyle needs.